Text type (e.g. hand-written, GRU tags, carved): Black paint. Mounting to wall: Screwed in at top, mounted on small shelf at bottom. Evidence of use in field (earth marking, cracking, staining, shrinkage): N/A. Surface insertion depth (into ground if apparent): N/A. Finish (varnish, paint, oiled, unfinished etc): White paint with lettering in black paint. Condition (cracked, paint peeling, woodwork, damage etc): Paint slightly faded. The Cross is mounted about six feet up on the wall to the left of the main entrance as you go in. 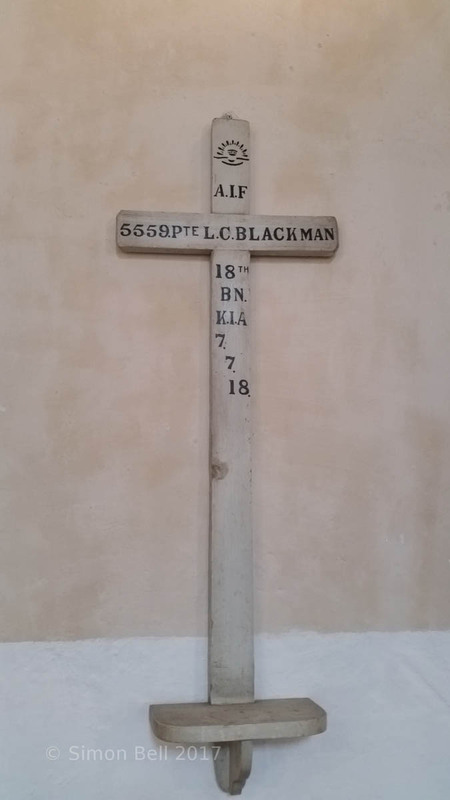 Looking at the cross to its right is a carved stone memorial with Pte.Blackman’s name along with all the other men from Hoo that died in the Great War. 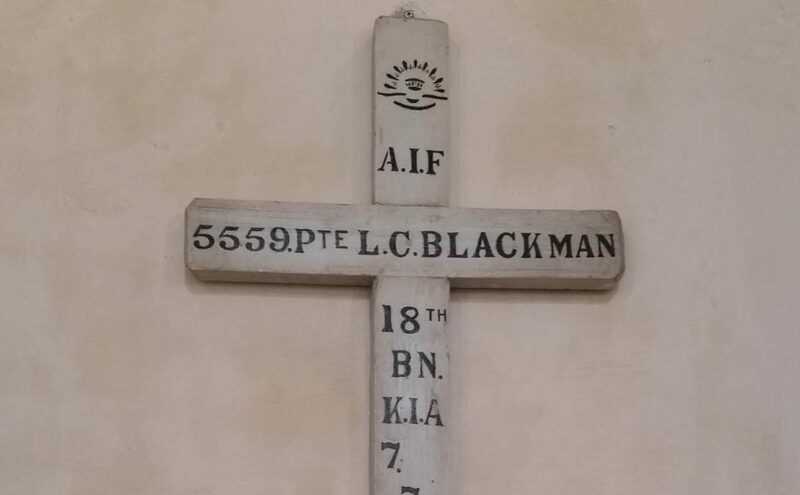 At the top of the cross is the Australian Imperial Force insignia in black paint. Birth Place: Hoo, Rochester, England. Parents: John and Emma Blackman, King’s Hill Dairy, Hoo, Rochester, England. August Offensive · the attack on Hill 60 · which lasted until 29 August and cost it 50 per cent casualties. For the rest of the campaign the 18th played a purely defensive role, being primarily responsible for hold Ins Courtney’s Post. 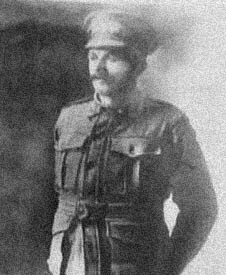 The last members of the battalion left Gallipoli on 20 December. After further training In Egypt, the 18th Battalion proceeded to France. Landing there on 25 March 1916, it took part In Its first major battle at Pozieres between 25 July and 5 August. The battalion returned to the Pozieres trenches for a second time In late August. After a spell In a quieter sector of the front In Belgium. In 1917 the 18th was Involved In the follow-up of German forces during their retreat to the Hindenburg Line, and was Involved in some particularly heavy fighting around Warlencourt. In late February. The battalion took part In three major battles before the year was out: the second Bullecourt (3-4 May) in France; and Menin Road (20 – 22 September) and Poelcappelle (9-10 October) In Belgium. After another winter of trench duty, the spring of 1918 brought a major German offensive that the 18th Battalion helped to repel. With this last desperate offensive turned back, the Allied armies turned to the offensive end the 18th participated In the battles that pushed the German Army ever closer to defeat: Amiens on 8 August, the legendary attack on Mont St Quentln on 31 August, and the forcing of the Beaurevoir Line around Montbrehain.